Can't believe how quickly this game has lost its value. GTA5 seemed to hold its value for ages. Presumably it's the shocking multiplayer? Whatever the reason, great price. I loved all of the GTA games and Red dead redemption but I found this to be so slow going and a drag tbh. I didn't even complete it in the end and ventured on to something else. Fantastic game and very strange how its value has dipped in comparison to the massively overrated gta5. Such a contrast of brilliance Vs awfulness with the single player and multiplayer. Put some jet packs or flying horses in multiplayer or something. No one would moan at this point. Such a contrast of brilliance Vs awfulness with the single player and …Such a contrast of brilliance Vs awfulness with the single player and multiplayer.Put some jet packs or flying horses in multiplayer or something. No one would moan at this point. 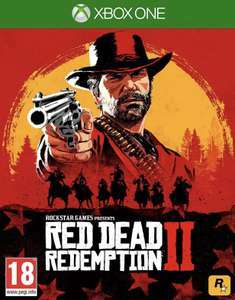 Apart from the single player is just tedious and monotonous when compared to the first one, the fact the price just keeps dropping and dropping illustrates game consumers are not buying it for reasons many. To be fair, this is probably dropping quickly from Boomerang as there was probably massive rental demand for this at launch so they bought lots of copies, and therefore are currently discounting them, as rentals have dropped off, to ensure they get them sold quickly to help cashflow rather than price them higher.